Bonnie is a lovely black ex-racing greyhound who was born June 2008. She is house trained, spayed, inoculated, microchipped and weighs 26.4k. Shortly after she arrived she had a dental when 3 loose teeth were removed and the rest cleaned. * The branch kennel at the bottom of our garden is where Bonnie and the other resident(s) will be for the first day or so until she gets to know the other greyhounds. 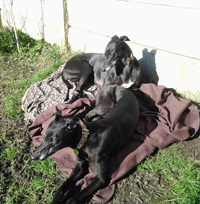 She has use of our garden and paddock, and once she gets to know the other dogs she will be allowed in the house during the day and all the dogs will then take it in turn to sleep in the house at night, so they become use to sleeping in both the kennel and the house. 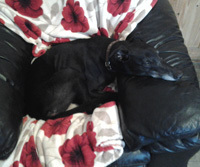 This afternoon Nigel came to walk the dogs, one of which was Bonnie who he said was very calm and easy to walk. 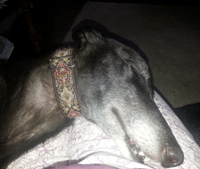 This morning Bonnie went to the vet where she had her dental, which on this occasion was just a clean and descale. The vet having removed the 3 loose teeth when she went in to be spayed. She weighed in at 26.4k. When all was done she came home and slept on a dog bed in front of the fire to sleep off the aneasthetic. 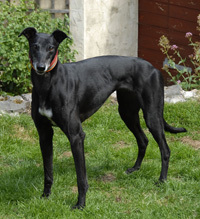 This afternoon Bonnie went off with Flower and Colin who are going to foster her until we can find her that forever home she is looking for. She wasn't too sure about jumping in the car, but with a helping hand she managed okay, and off they went to meet the other 'four' legged members of the family they had left at home to give Bonnie more space in the car. 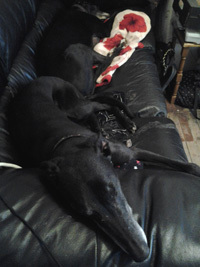 This evening Flower emailed to say Bonnie is guite happy and settled, and has taken a shine to Lenny, one of their other dogs. After the initial introductions which went smoothly they all went in the garden and she had a game of tig with him, then they all had a play. Bonnie then came inside, explored the house and burgled the toy box! It looked like a toddler was in the house with toys strewn everywhere! 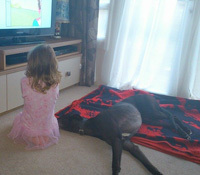 She lay perfectly well behaved in the kitchen whilst Colin prepared their tea. On the other hand, when they sat down to eat with a tray on their knee she keft trying to get it. She got the message guickly, that is a no no. Think this will take a little working on. 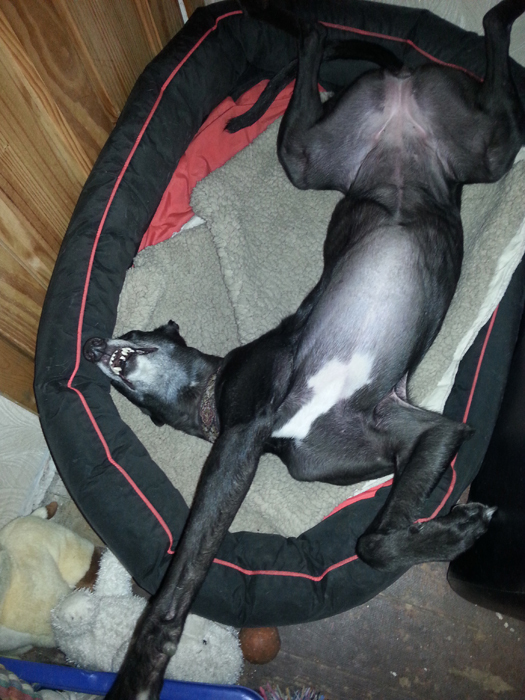 She is presently on her back on the settee with legs akimbo - it didn't take her long to work that one out. 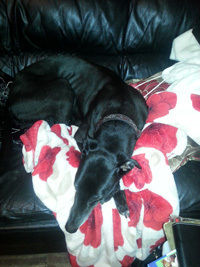 We received an email this evening from Flower who is fostering Bonnie. 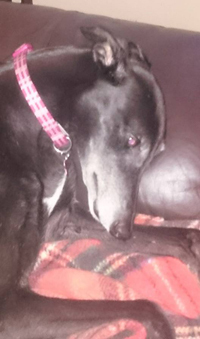 Flower says Bonnie is quite the little character who absolutely loves her balls and toys. When she is in play mode it's funny to watch her enjoy life. Bonnie goes to bed at night with all the others now, and as soon as they turn the light off she is there waiting to go up the stairs. They haven't encouraged her to do the stairs, she did them herself after a couple of days of being with them and she has no problem with them at all. She also appears to be very much 'bomb proof', nothing bothers her or worries her. She is a very confident little dog and absolutely loves the grandchildren. She will be a treasure and a pleasure for whoever adopts her. We received some emails today from Flower letting us know how Bonnie was settling into her new foster home. She took a little fancy to Flower's 'Hamish' on her shopping bag. She did it so gently Flower never felt her take it, and when she realized she had a tug of war, the game was enjoyed and Hamish was retrieved safely. About 5pm she was bringing the washing in when Bonnie came out of the back door as if she was leaving the trap, one lap around the garden and back inside, into the front room and out again to repeat the whole process three more times. When the other dogs came out to see what all the fuss was about they spoiled her fun by getting in the way. It was so very funny to watch her Flower couldn't stop laughing. She thinks it must be the spring air because it was a lovely day and all the doors were open so they could all come and go at will. Bonnie gets quite excitable when passing smaller dogs, and when looking through the back gate onto the field from the garden where many people walk their various breeds of dogs. One day Bonnie stood in front of the gate leading to the field in the rain watching them. She was so enthralled she didn,t want to come In, and when she did Flower towelled her dry. Bonnie is also very clean in the house apart from the first night when she had an accident because Flower said she misread the signals. We received an email today with a picture of Bonnie with her new toy which she thinks is wondetful. 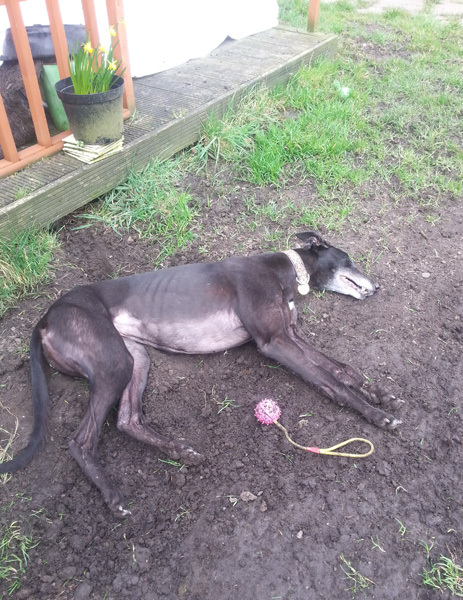 They had a nice game of fetch, and tug of war, then she decided to lie in the soil. It must be cool for her as there are dog beds in the garden on fine days, but they appeared to be a 'no no'. She has such a zest for life and is real cheeky little monkey. 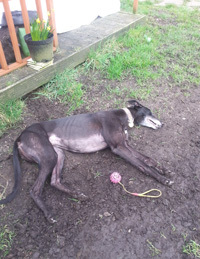 Bonnie, although happy to lay in the soil, quickly realised it was much nicer on a snug blanket with her greyhound companion, also called Flower! 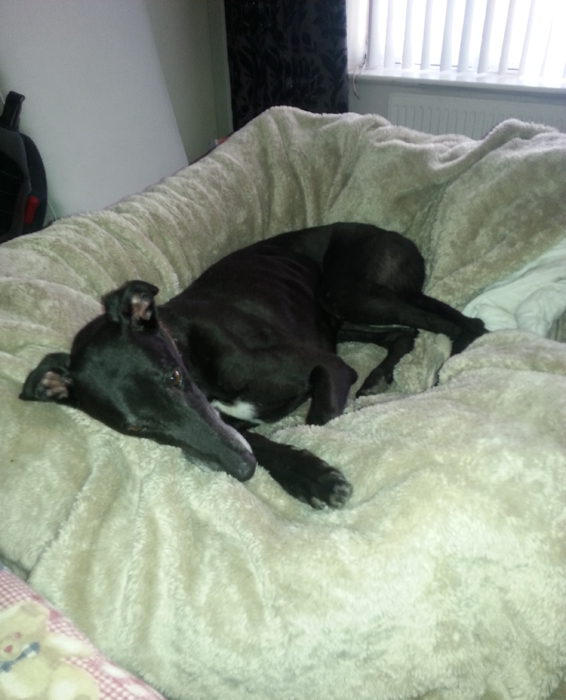 Flower sent us an email today letting us know that yesterday they had their little grandaughter of 2 years old stay. They both had a great game of catch and tug of war, but Bonnie can be a little zelous as yet and needs to learn to be a little more gentle around the very young ones, which she will be the more they play together, she hasn't got a bad bone in her body. 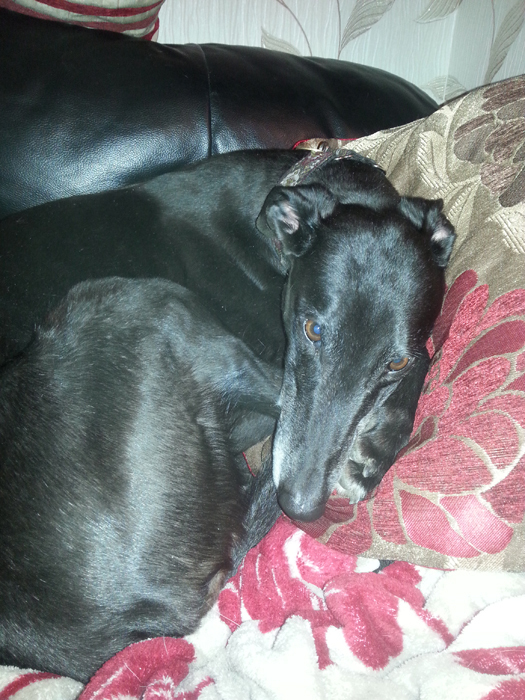 We heard today that Bonnie loves snuggling into a cushion. 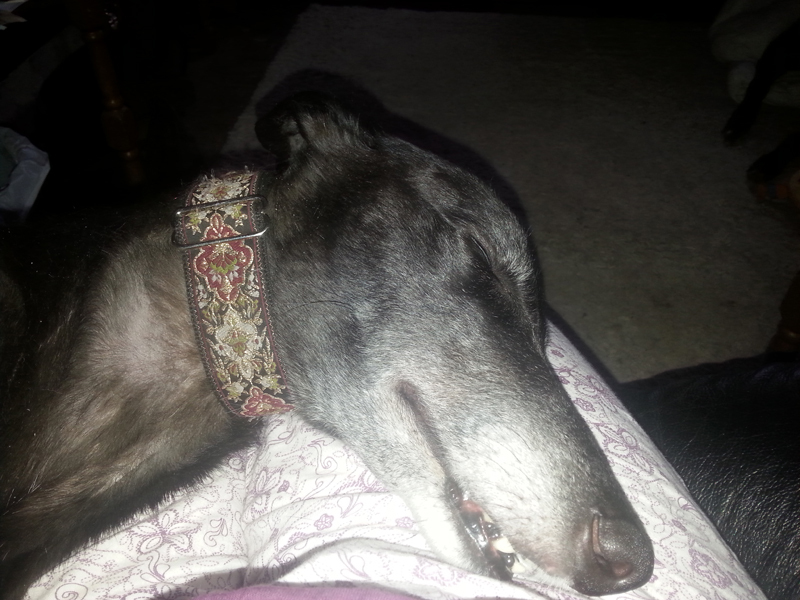 She loves cuddling so much she tried climbing on her foster mum's knee earlier because Flower was laying on the settee and she couldn't get on with her. They went passed some road works today while out walking and cheeky little Bonnie wanted to investigate inside the van, she had a good sniff, and curiosity satisfied they moved on again. 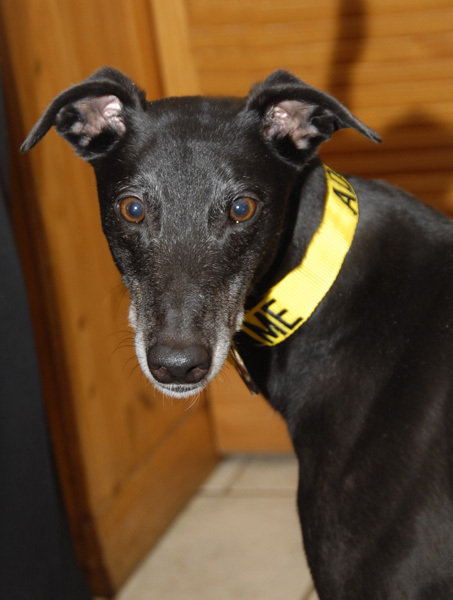 She is a real curious dog who loves people and takes an interest in everything around her. We heard today that yesterday afternoon Bonnie played in the garden with a full size football, hich she then brought inside to have another game, she really does enjoy playing games, but it seems only she knows the rules to! 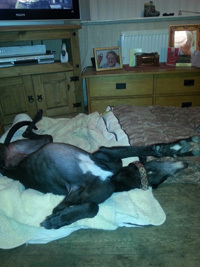 The photo we received is Flower's bed which her owner lifted onto their bed so she could put the ironing board up. 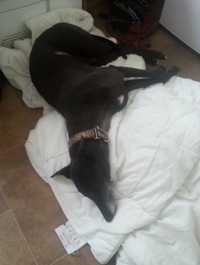 Bonnie wanted to be with her and decided it was sheer luxury a dog bed, on a human's bed. Bonnie stayed there guite happy and contented long after the ironing was done. Bonnie loves to be with one of them and likes to help with everything and join in. 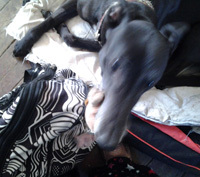 This morning we heard that Flower had a kick about in the garden with Bonnieand her football then she came in to carry on washing the bedding and prepare dinner under the supervision of Bonnie who is guite happy to lie on the cold hard floor whenever she is busy in there. 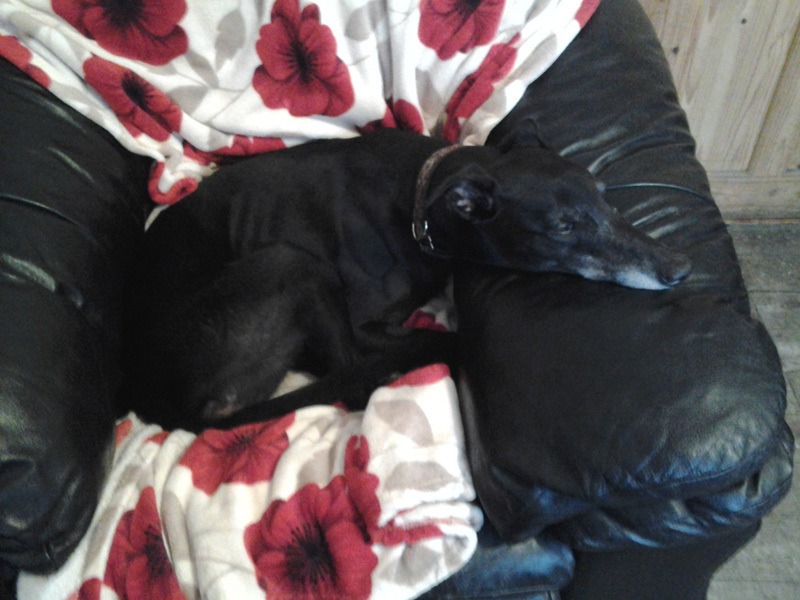 Today was sheer luxury for her because she had a pile of washing to lay on! 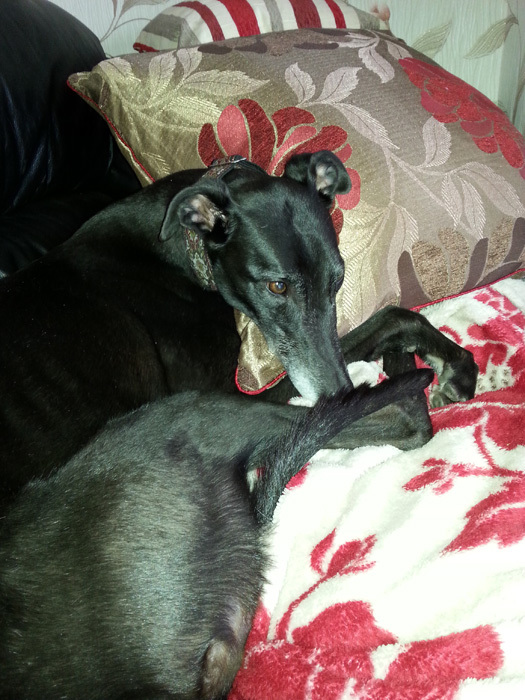 Bonnie is calming down now and settling into home life very nicely. 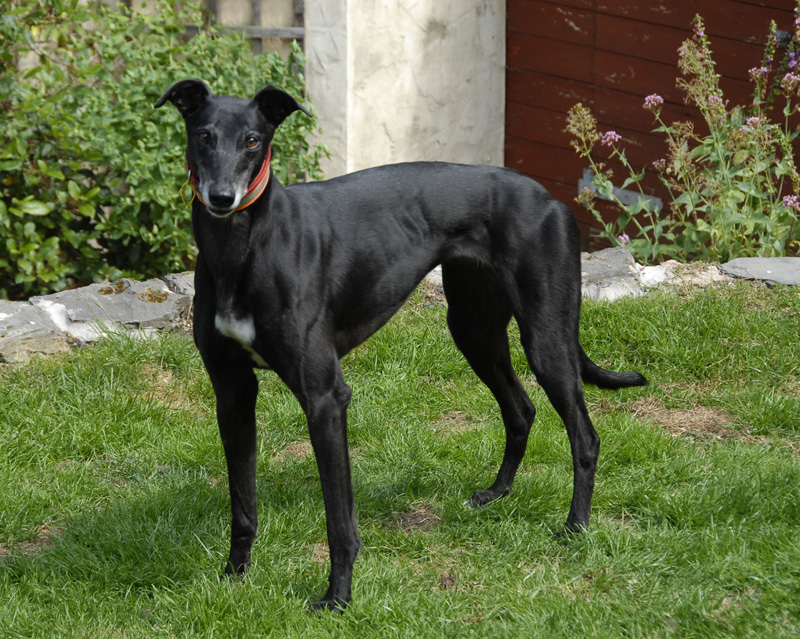 She is still a little character and will suit someone who is active and will give her plenty of walks and interaction.She has a real mischievious side to her, she will go into play mode and will help herself to whatever takes her fancy to play with. She never chews anything though,all is left intact. This afternoon Bonnie chilled out on the local pub floor, and was quite happy. It was her first visit and there was only one other person there! Received an email today from Flower letting us know that having just walked the dogs, she came back and put all their beds in the garden. Some in the shade and some in the sunshine. Where does Bonnie choose? 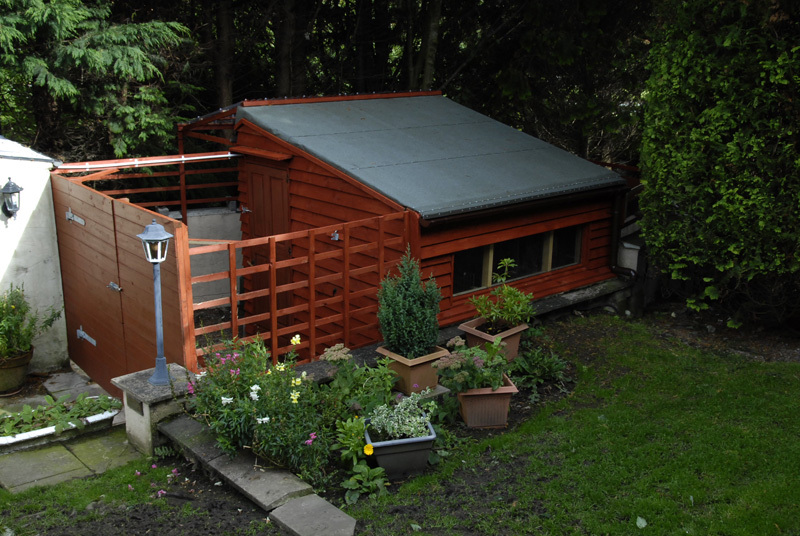 The play house followed by her favorite patch of soil in the garden - you can't win them all! Bonnie weighed in at 27.4k today. 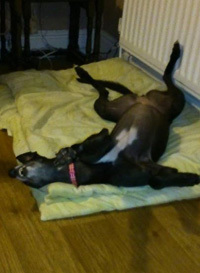 Flower sent us an email today letting us know that Bonnie is happy and living life to the full. She is such a happy wee soul and her curiosity has not left her since she arrived in her new foster home. She inspects every thing with zest. Flower has been weeding in the garden this afternoon with Bonnie often checking she was doing a proper job, she makes a very good overseer! Their two grandchildren were also there tidying the playhouse and Bonnie went in about three times and made herself at home. One of them locked her in accidently and she was quite indignent, and soon barked to be let out. Flower thinks Bonnie may look on it as a kennel, but didn't want locking in. She is now snuggled up in her favourite spot - on the settee next to Flower. This afternoon Flower brought Bonnie here because she feels she will find her forever home much quicker if she is here where people come and visit the dogs - then they can see how beautiful she is. Bonnie has been playing at chasing her tail today, which the others thought most entertaining. Bonnie was finding it increasingly more difficult to come to terms with and accept all the different kinds of dogs coming to stay at our bed and breakfast. Their coming and going made her very anxious which in turn was making some of the others anxious. As soon as she went outside she ran up the garden bank to the balcony where guest dogs may be out causing the others to charge after her and almost overwhelm any guest dogs there may be there. The other greyhounds would come running back to me when I called them, but not Bonnie, who from her body language showed anxiety with the closeness of the dogs being there. 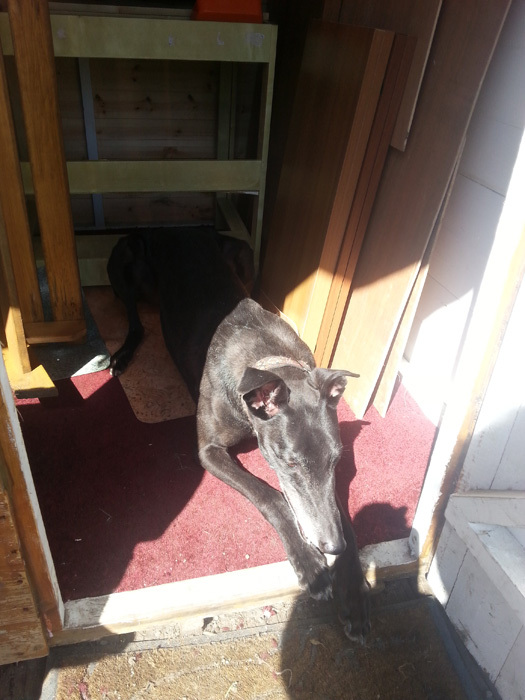 As the summer wore on she showed no signs of improvement no matter what we tried, so after much thought, we phoned Tom Edgar at the West Cumbria branch of the Retired Greyhound Trust in Workington and asked if he could take her in to prevent this behaviour becoming habitual. He said yes, and arrangements were made to take her to him. It was a very sad day and I felt I'd let her down, but I knew I was doing the right thing and I would continue to promote her on my web site until she found her forever home. 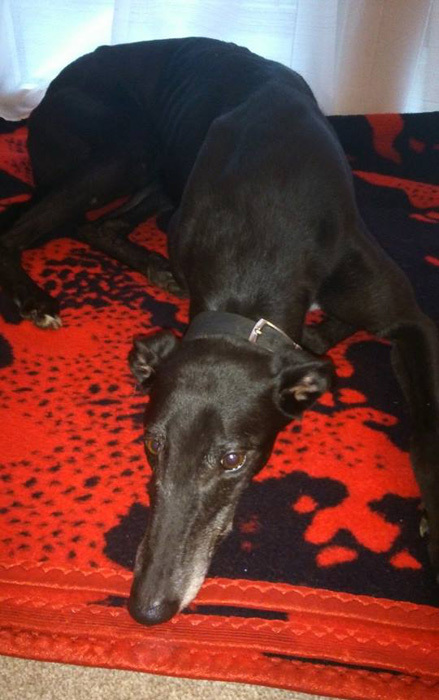 We received a Facebook message this afternoon from the lady who was interested in re-homing Bonnie. She had made arrangements to visit Tom at the West Cumbria Branch today to see Bonnie, fell in love with her and took her home with them. I can't tell you how happy that made me, it was the best news I'd heard all day and it was super news. A photo taken by Bonnie's new owner was shared to my Facebook page showing her very relaxed, laying on her back with legs akimbo - think Bonnie is settling into her new home okay! We heard today that Bonnie's new owner took her to a greyhound meeting today. 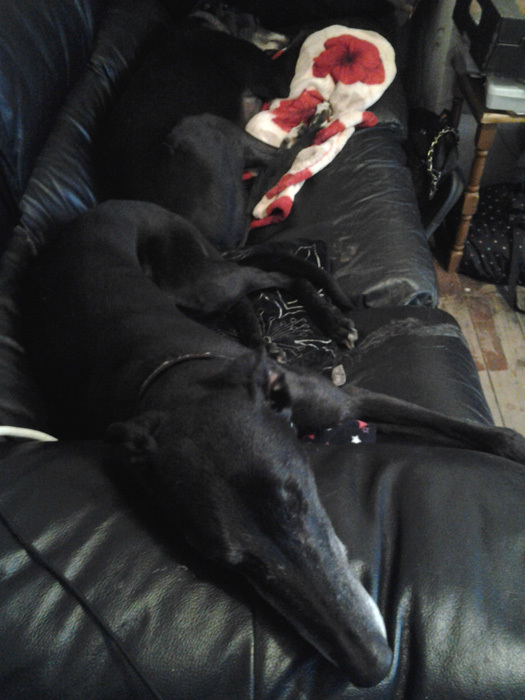 One small room with 13 greyhounds!. She did so well, a few grumbles, but on the whole was great. Even lay down and settled on her side. She is just a pleasure to own and be with this Christmas. 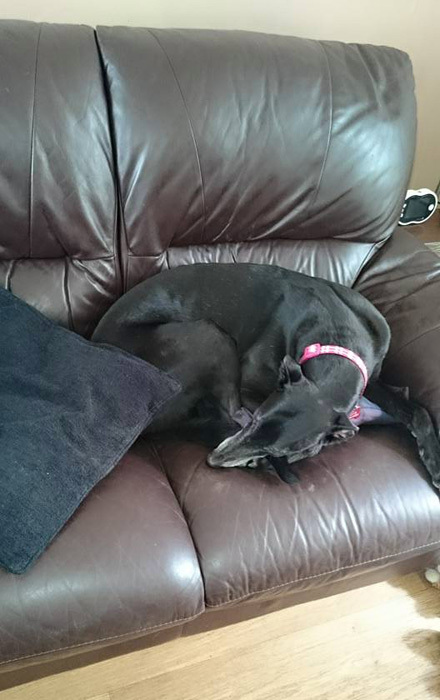 We heard today from Bonnie's owners through Facebook that they think she's a lovely dog whose settled really well and has helped fill the void left behind after they lost their last two greyhounds. 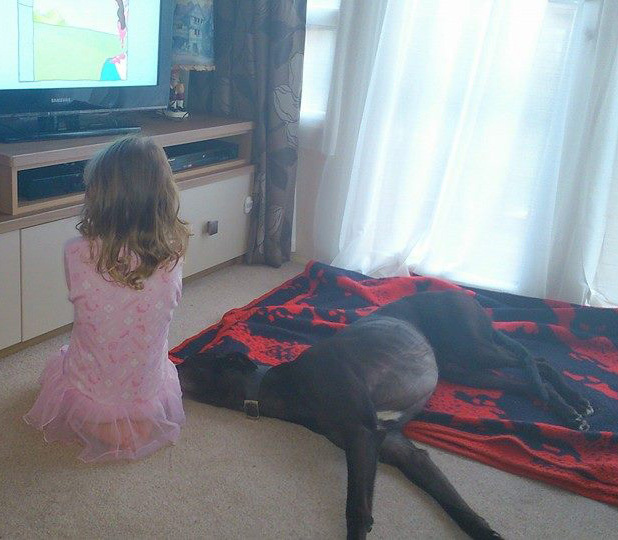 She's still keen and not great with little dogs, but they say they are used to greyhounds so all is good. perfect for taking a nap!